After a fairly divisive episode last week, The 100 comes back this week and tries to justify a few of the character moments that had a lot of folks up in arms. In theory, this is the kind of stuff The 100 does well. It dramatically shifts the dynamic of the show by following through with a few questionable character decisions, and then explores the effects of those decisions throughout the rest of the season. This show has always been about, in one way or another, repercussions (or Reapercussions). 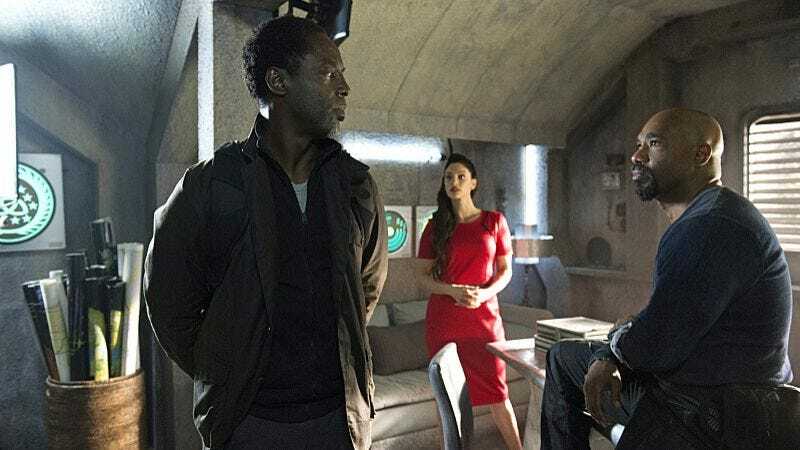 The 100 is interested in how decisions are made in a society where warring ideologies and armies keep things in a constant state of unpredictability. Thus, this week’s episode, “Hakeldama,” puts a lot of the focus on Pike and Bellamy’s decision to attack the Grounder peacekeeping force led by Indra. Pike and his army return covered in blood from their nighttime slaughter, and yet, as Abby notes, there’s not a single wounded member among them. Shades of Finn massacring a village of Grounders abound when Clarke and Lexa, transporting the Ice Queen to Arkadia to show that a peace has been reached, stumble upon the 300 bodies, bullet holes in all of them. Indra is left alive though, “thanks” to Bellamy, to deliver a message from Pike. Essentially: the Sky Crew rejects the coalition, so get off this land or be killed. For Lexa, it’s an easy decision. She calls for her men to gather the armies of the 12 clans in order to lay waste to Arkadia. Clarke jumps in though, asking Indra to radio for Kane so that she can work out some sort of deal. Immediately, things seem off. What I mean is that this version of Clarke—the scrambling, trying to save her people version—is something we’ve seen a lot of in the past. She’s always been one to exhaust every single option before resorting to violence, and that makes sense here…at least initially. It’s slightly repetitive storytelling though, which is something The 100 normally manages to avoid. Things only get worse when Octavia shows up to take Clarke to Arkadia. Kane couldn’t make it because Pike has his eye on him, but Octavia offers to bring Clarke to Bellamy to try and work out some sort of plan to save everybody. When Clarke manages to sneak in and actually meet with Bellamy though, things go off the rails in much the same way they did last week. The conversation that Bellamy and Clarke have hardly feels rooted in the characters that we know. The barebones character rationale is there: Bellamy is angry at Clarke for leaving, for abandoning him, and that pain is only compounded by Gina’s death. The problem is that the reaction doesn’t seem to fit the reasoning. When Bellamy handcuffs Clarke and tries to bring her to Pike, or when he tells Octavia to “stop playing Grounder,” it’s a stretch to see how his actions connect to his character arc of the past two seasons. Unfortunately, the hasty storytelling on display with Bellamy starts to influence the other storylines around him. After Octavia helps Clarke escape, she informs Lexa of the situation. It’s clear to Indra that the only option left is for Lexa to attack, to wipe out Arkadia. Clarke pleads with Lexa though, saying that someone has to take the first step towards peace, so why can’t it be her. That would be a perfectly fine argument in almost any other situation, but here it rings completely false. Just as with last week’s episode, it feels like The 100 is moving far too quickly, not taking its time to consider character motivation and shifting dynamics. Part of that, to be fair, is the hurried nature of wartime; still, the fact that all of these people have suddenly gone from relative peace to contemplating war seems rushed storytelling at best, and lazy storytelling at worst. The way Clarke and Lexa talk about keeping peace rather than retaliating doesn’t feel true to the narrative, where 300 of Lexa’s people have been slaughtered. It’s a shame that this plot feels so contrived because the show is working magic elsewhere. Jaha returns to Arkadia this week, and he brings with him a renewed purpose. I, for one, like the new version of Jaha, at least in terms of what his character brings to the table. If The 100 is focused on showing how societies form and coexist, faith and religion needs to be a part of that. Sure, Jaha’s proclamations may not be exactly religious in a traditional sense, but the language is the same. He speaks of salvation, forgiveness, the loss of pain, the belief in something bigger than the self. That’s interesting enough in and of itself, but add to the fact that he’s recruited an existentially-tormented Raven—that final scene was amazing— and suddenly things get a lot more complicated. The 100 is good when it’s complicated. As solid as some of this other stuff is—from the mysteries of the City of Light to Murphy’s kidnapping—it’s not enough to distract from the larger problem forming at the heart of this season. “Hakeldama” is wonderfully paced, and the thematic explorations are on-point as usual, but it’s an episode that can’t pull out of the tailspin caused by last week’s corner cutting. “This land is ours now!” Pike, you’re the worst. Raven’s struggle is one of the most interesting and complicated aspects of the show right now. Here’s hoping they keep the momentum going, in terms of her storyline, next week. Octavia’s smile followed by “I was born for this” made me cheer out loud, not going to lie. I don’t know about you, but I’m not sure I trust this woman in red. 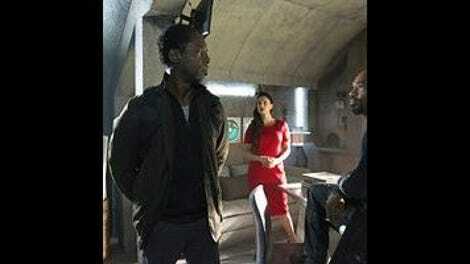 One thing about Jaha and his “craziness”: don’t forget what he’s been through. “This isn’t you!,” Clarke says to Bellamy. Clarke is all of us shouting at our TVs. “I’m sorry for leaving. But I knew I could because they had you.” Perhaps the only good line in the exchange between Clarke and Bellamy. Gut-wrenching stuff. I want Lincoln to punch all of these Sky People over and over and over again. So, Pike wants to “clear” a Grounder village that’s within his imposed 15km radius. IS NOBODY GOING TO BRING UP FINN?!? !